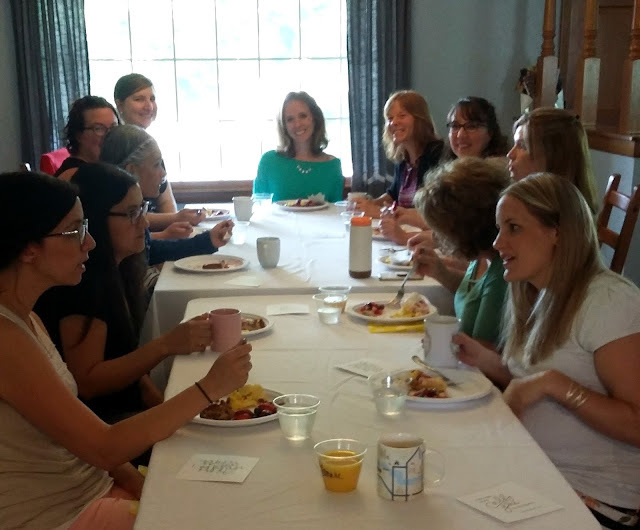 Recently I hosted a Blessed Brunch in my home and I received quite a few questions from women such as "Is it easy to do?" "What are the expectations?" and "Who came?" These questions came from local friends and strangers online but there were a lot of them so I wanted to share what my experience was like in case you, too, have been looking to build some friendships and were wondering if a Blessed Brunch was the way to do it. 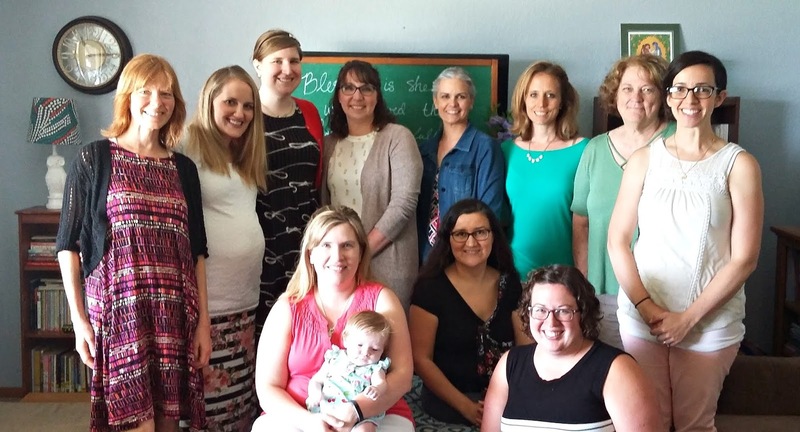 To begin, I went to the Midwest Region Blessed Is She Facebook group and asked if there was any interest in my area in having a BIS group to meet over the summer to do one of the Mystery Studies with me. When I learned that women were interested I signed up on the BIS website to host a Brunch, which I then publicized on my personal Facebook page and in the Midwest Regional Group. I thought a Brunch was a nice way to kick-off the Study but a Blessed Brunch can definitely be a stand alone thing. And then Blessed Is She did a lot of the work for me. They put the link to sign up for the Brunch on their page and emailed me with info every time someone signed up. With each email I received I would then contact the woman who had registered, telling her how happy I was that she was coming; reminding her of the date, time, and that lap babies were welcome; and sharing my address with her. The day before the brunch I did my shopping, some cleaning, and some prep work. I bought paper plates and plastic cups, orange juice (I bought two but only one was drunk), creamer, and some chocolates. I used paper napkins that were left over from my son's First Communion, our regular forks, and coffee cups. I borrowed white tablecloths and a long folding table from my mom. I cut some flowers from my yard, cleaned my bathroom and kitchen, dusted my living and dining rooms, and vacuumed. The morning of my husband loaded up the kids and off they went for about three hours. 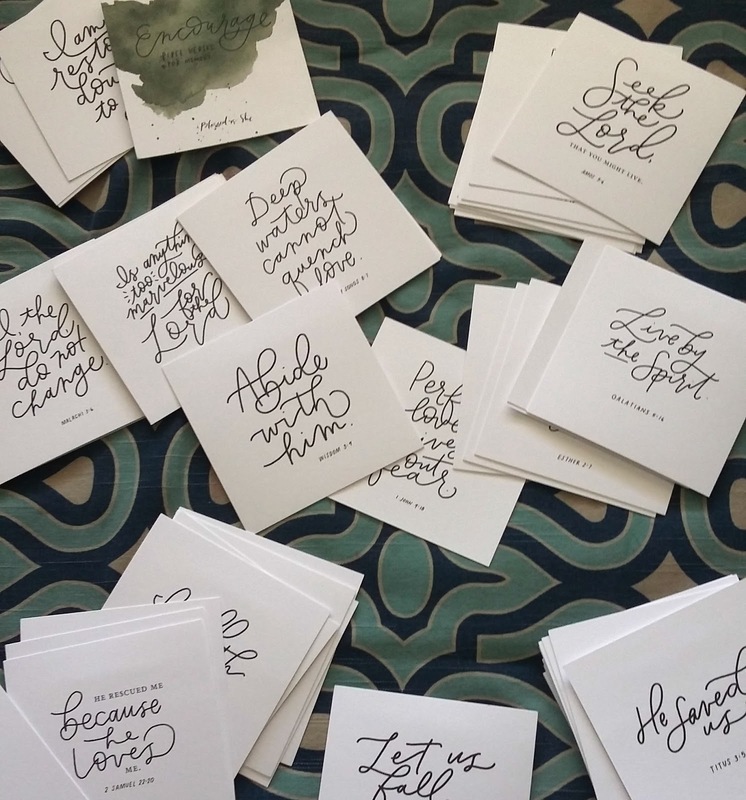 I brewed some coffee, set out ice water, put on this Spotify playlist, and set out these Encourage Scripture cards. 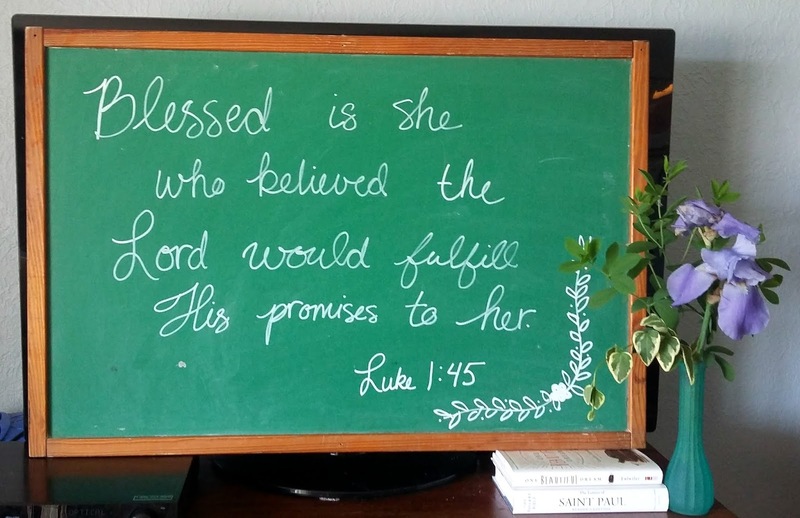 Now, Blessed Is She emails the host a sign in sheet for the guests, a suggested prayer to lead others in, an outline for the brunch so you know what to do when, and suggested discussion topics but I wanted to do something a little extra. Upon their arrival, I invited my guests to go through the Scripture verses and choose the one that spoke to them the most. Then, at brunch we went around and introduced ourselves and shared with Scripture card we picked and why. It allowed women to share parts of their stories that they wouldn't have otherwise and I'm so glad the Holy Spirit put that idea in my head. I then invited everyone to take home their card to frame, tape to their mirror, or stick in their Bible. I don't share that with you so you feel like you need to do something like it too but so you know that it's okay to vary a bit from the provided script! If the Holy Spirit nudges us to do something we should follow! We did use the discussion questions that were provided by Blessed Is She but there was also lots of time to just chat and get to know one another. Just about every age and stage of woman was there - single, married, pregnant, postpartum, grandmother, working, stay-at-home, small family, adoptive mom, big family, and on and on. Some of the women I know very well, some I know casually, and some I met for the very first time. It was so nice to have such a great mix! Because I knew I wanted to do one of the Mystery studies I set out my copies next to the sign-in sheet. 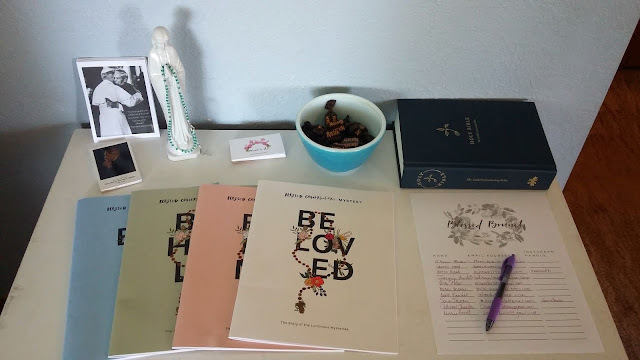 I also put out some holy cards and the chocolates for women to take if they wanted. In the last twenty or so minutes I invited everyone interested in doing a Study to sign in and look at the Studies to get a feel for which one they'd like to do. Then we closed in prayer. Everyone packed up their items and it was done. It was a wonderful morning! Everything ran smoothly and next week we will begin our Summer Study of the Luminous Mysteries. The Blessed Brunch almost ran itself and was such a wonderful event. If you are interested in starting something in your area I would really encourage you to pray about it and then take the leap if God is calling you to do it! You won't regret it! 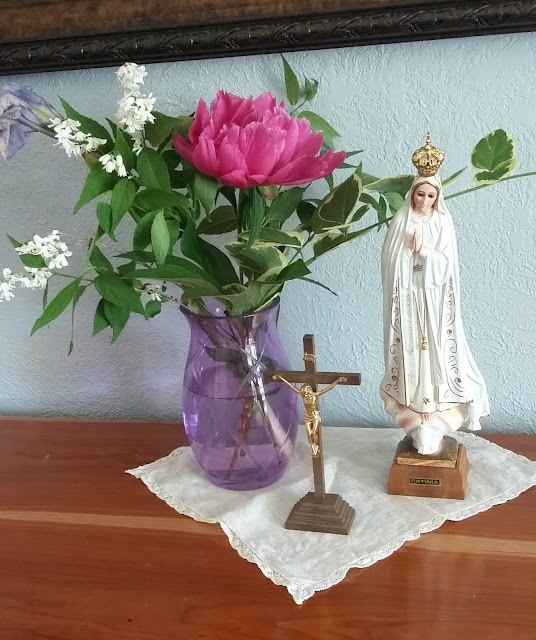 PS - If you are interested you can join a Blessed Is She Regional Facebook group here and you can sign up to attend or host a Blessed Brunch here. If you want to buy the Mystery studies for yourself you can do that here.